We are thrilled to present recent work by Basim Magdy, curated by Regine Basha of Bashaprojects. Magdy is one of today’s most important rising artists based in Basel and Cairo. This marks the first solo exhibition in London with Magdy, where one of his most recent films, ‘The Many Colors of the Sky Radiate Forgetfulness, 2014′ (Super 16mm film transferred to Full HD), will be on view for the first time in the UK. For over a decade, Magdy has been working with film, works on paper and photography and most recently with a unique system of ‘film pickling’ where the film is exposed to household chemicals that alter the color and image. Ultimately Magdy’s use of acidic or kaleidoscopic color in his work exposes the more traumatic element of the speculated narrative. His avid, combined interests in science, science fiction, natural phenomena as well as futurology, underline many of the works presented here. Magdy’s films often possess qualities of an experimental montage with a purposeful yet voiceless narrator whose observations appear to be coming from an outsider-looking-in perspective. Magdy’s overlaid textual narrations are made more dimensional by the accompanying sound compositions, which often lend the films a sense of urgency. The necklace of chosen images for the films, some wondrous, some banal, often heighten the sensorial experience of time slipping away. Like his previous films, ‘The Many Colors of the Sky Radiate Forgetfulness’ explores a tactile decay, as it relates to memory or active forgetting, and its consequences. Phrases such as, ‘Only stone, bronze and sky shall outlive all the rest’ suggest the consequences of a coming apocalypse as images seamlessly alternate between a decaying monument, natural ecological scenes and uncanny taxidermied animals. Though we are unaware of precise time and place (the monument is from WWI but the artist chooses to leave details ambiguous) the film reflects on the timeless, yet repeated fatal errors of forgetfulness by the human race and its continuously blind misinterpretation of the natural environment. 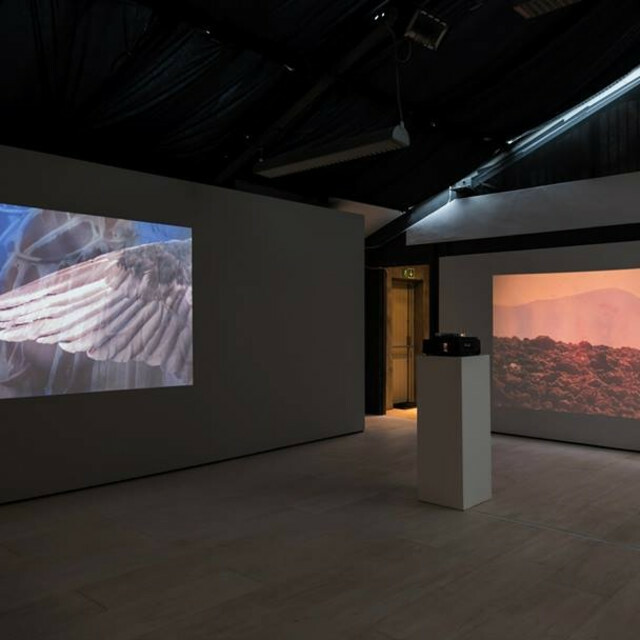 Another important work on view is ‘Investigating the Color Spectrum of a Post-Apocalyptic Future Landscape’ 2013 – an 80 slide piece projected onto the wall. Here, the scene depicts various colorized views of the volcanic terrain of Lanzarote, one of the most remote, untouched islands of the Canary Islands. Images of eroded lava, that have been treated with the same household chemicals are shown intentionally through this obsolete device, identifying in its own way the passage of time, and the slow degradation of memory and of material. The suite of photographs also on view, ‘A World Within a World Within a World Within a Green Coral Wall’ and ‘‘A World Within a World Within a World Within an Orange Coral Wall’2014 bring into closer focus Magdy’s interest in the timeline of natural systems by abstracting even further the surface of walls built from coral – what was ripped from the sea is constructed into the built environment. Overall, Magdy’s magnification of micro natural worlds is deemed as potent, if not more potent than the cultural landmarks we choose to build and uphold. As if through a portal, we are led to consider the unbearable thought of the apocalypse through an absorption of poetic, seductive imagery of future loss. Basim lives and works in Basel, Switzerland and Cairo, Egypt. His work was recently part of international exhibitions and events among which are a solo exhibition at Art in General, New York (2014); La Biennale de Montreal, Montreal (2014), Art as a Verb, Monash University Museum of Art | MUMA, Melbourne, Australia (2014), MEDIACITY Seoul Biennial, Seoul Museum of Art, Seoul (2014); Trafo House of Contemporary Art, Budapest (2014); CRAC Alsace, Altkirch, France (2014); 13th Istanbul Biennial, Istanbul (2013); Tate Modern, London (2013); Sharjah Biennial 11, Sharjah, UAE (2013); Yerba Buena Center for the Arts, San Francisco (2013); Biennale Jogja XII, Yogyakarta, Indonesia (2013); The High Line, New York (2013); Askhal Alwan, Beirut (2013); Haus der Kulturen der Welt, Berlin (2012); La Triennale: Intense Proximity, Palais de Tokyo, Paris (2012); Argos Art Center, Brussels (2011); Kunsthalle Wien, Vienna (2011); Institut Mathildenhohe, Darmstadt, Germany (2011) and Ateliers de Rennes – Biennale dʼart contemporain, Rennes, France (2010). In 2012 he was shortlisted for the Future Generation Art Prize, Kiev and in 2014 he won the Abraaj Art Prize, Dubai, as well as the New:Vision Award at the 2014 Copenhagen International Documentary Film Festival for his film The Dent. In the Spring of 2013, Basim Magdy was in conversation with Regine Basha, Stuart Comer and Omar Kholeif at the Tate Modern.